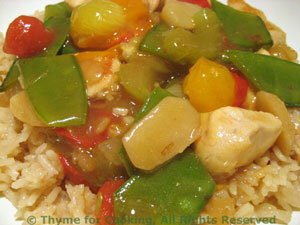 Thyme for Cooking Dinner tonight: Stir-Fried Chicken, Snow Peas (Mangetout). As this is the only celery I used this week I listed it as optional. I had a bit left... The water chestnuts add a nice crunch. I used both red and yellow tomatoes.